My mother was of that generation of women who, wanting to go to college, instead had to go to work in their teens. All money was handed over to her mother for the family's expenses. At the age of eighteen she married my father and spent the next ten years seeing him through undergraduate school and his master's degree. By then she had two children, and was working full-time to pay our bills. Her fondest dream in life was to attend college. Although she occasionally had the opportunity to take a few courses (such as when she was assistant to the Dean of Rutgers University), getting her degree began to seem like sheer fantasy. In 1975 she was diagnosed with Multiple Sclerosis. 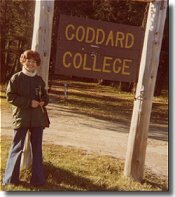 Realizing she would have to stop working in the next decade, my brother and I convinced her to apply to Goddard College's adult education program. This program would allow her to study at home under close supervision, attending Goddard for several weeks a year. Those years were the happiest of her life. She managed to continue working as a fundraiser for Bank Street College of Education while studying nights and weekends for Goddard. Although by the time she received her undergraduate degree she was already having a difficult time walking (and used to joke about everyone thinking she was a drunk because of the way her legs would wobble as she moved from place to place), the day she got that degree was the proudest day of her life. It shortly became apparent that she would never be able to return to work full time. She grew very depressed; she, a woman who had worked full time since her early teens, who had always supported herself and those around her, was now unable to care for herself financially. As time went by she became less and less capable of caring for herself physically as well. In hopes of easing her depression and giving her a goal in life, we again convinced her to apply to Goddard, this time for a Master's Degree. Through the next four years we watched her struggle with the fatigue and debilitation the MS caused. Weeks went by where she was sure she'd never be able to hold a pen again, much less complete her courses. During that entire time, Goddard's staff were there for her, encouraging her, giving her extra time when it was necessary, and providing an infrastructure that kept her focused and less afraid than she'd been before. She obtained a Master's in Playwriting from Goddard and framed it, along with the undergraduate degree. As the years passed, her slow decline escalated, from walker to wheelchair, from feeding herself with oversized utensils to having to be fed by aides and family. Toward the end of her life she ran out of energy completely, and no longer wished to interact in a pro-active way. Instead, her world became the television and visits from her children, who would sit quietly with her and watch. She spent the last three years of her life in this manner, sitting in her wheelchair and watching opera on the New York public service networks. Through all that time, she made sure her degrees were hung right next to the television, where she could always see them through the course of her days. My mother introduced me to folk music, jazz, poetry, the theater; she took me to my first concerts and stood with me when I received my Grammys. It was she who insisted I be given piano lessons, she who talked my grandparents into buying me my first guitar. She attended every show I did in New York, even in a wheelchair. The proudest thing I ever did with the money I earned from my career in music was sending her to college. Goddard kept my mother alive, and healthy, longer than she would have been without them. Even at the end, cheerful letters and updates arrived regularly, allowing her to feel she was still part of the world she'd so longed to join. * You can read about Janis' mother in more detail in Janis' autobiography, Society's Child.